Thanksgiving this year has been kind of odd for us. It’s one of my favorite food holidays, but by the time actual Thanksgiving (read: American Thanksgiving) hit, I was feeling a little bit of Thanksgiving fatigue. We’d celebrated Canadian Thanksgiving back in early October with our family up here in Ottawa (turkey: smoked), then Thanksgiving II in early November with our wonderful friends back in Maryland who, bless them, hadn’t given us too much pushback on celebrating TG2 before TGprime (turkeys: smoked and fried). So by the time actual Thanksgiving rolled around (turkey: cut into pieces and roasted, with herbs), it was my third time within two months making mashed potatoes, cranberry sauce, and green bean casserole, and the whole thing was starting to feel a bit routine, just another turkey dinner. With only a couple of dishes to worry about, it was a delightfully relaxed Thanksgiving Day. And then we had a wonderful dinner with family (again) and one of K’s coworkers, and we have been eating pie for dessert for a week straight now; I can’t complain. But on to the meat (so to speak) of this post: if you bought herbs to flavor your bird, or your sides, it’s likely that your post-Thanksgiving fridge contains partly-used packets of herbs. 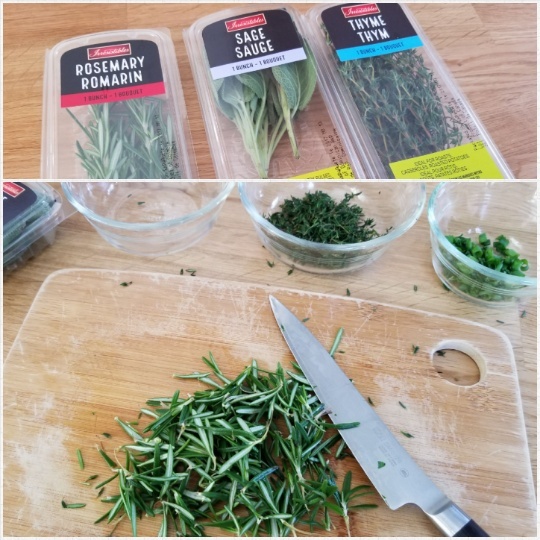 These herbs are generally destined for sadness — it really is hard to use up a whole bunch of herbs at a go, since recipes generally call for only a couple of sprigs at a time — and I have been guiltily throwing away dry, wilted brown herbs for years. But this year I was determined to change that. 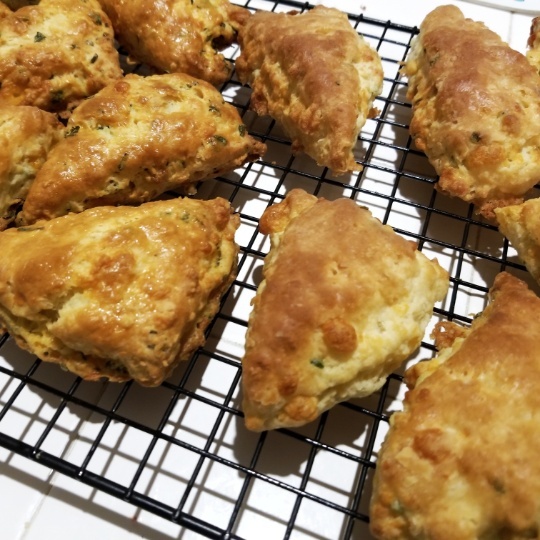 I decided to modify my favorite jalapeno-cheddar scone recipe for the purpose. It’s a straightforward recipe: cut off part of a stick of butter and saute minced jalapeno in it, then toss that with a bit of flour and a couple of handfuls of shredded cheese; whisk 2 cups flour and 1 tablespoon baking powder, then cut in the remainder of the butter, mix in eggs (2) and cream (1/2 cup), then mix in the buttery pepper and cheese. 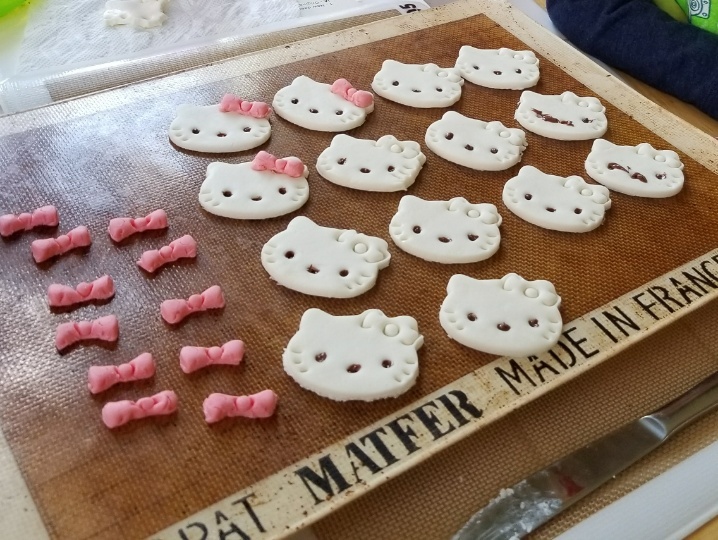 It’ll make a dough, which you press out, cut up, and bake. Brush with egg wash if you want a glossy top. So I washed and cut up the herbs, which was a very fragrant experience. This was actually the most time-consuming part; there were a lot of tiny leaves on those spindly stems. Then I got out a stick of butter. (Actually I cut off a quarter of a block of butter. Butter up here is mainly sold in solid 1-lb blocks.) 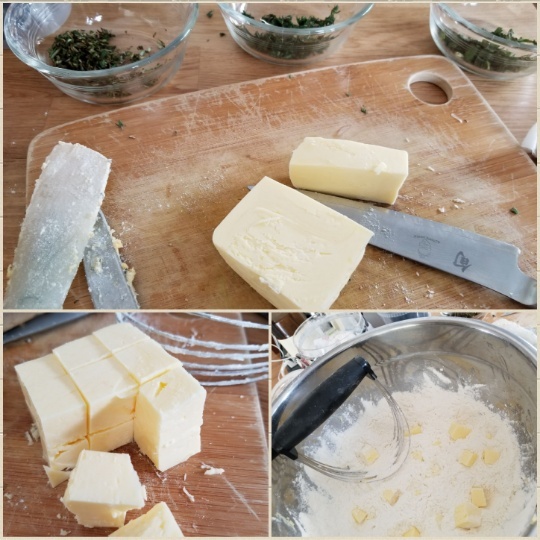 I cut off a smallish chunk of it and let that brown slightly in a saucepan on the stove, then dropped in a good amount of mixed chopped herbs so that they would cook slightly and infuse the butter. (Maybe a half cup of herbs? I didn’t measure. This is a very forgiving recipe.) The rest of the butter got diced up and cut into a bowl with flour and baking powder. Then the liquids (eggs and cream, except I was running short on cream and had to cut it with milk, I told you this recipe was forgiving) and herbs got mixed in. 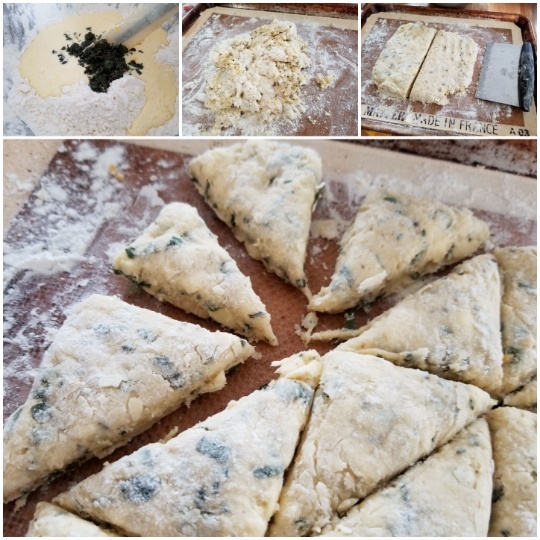 When the ingredients formed a relatively cohesive dough, I dumped it out onto a floured surface and patted it into a flattish mound, then cut it up into triangles. Classic scone shape, triangles. Bake in the oven at 400 degrees for about 20 minutes; they’ll puff and turn golden, and the cut edges will be beautifully craggy. The egg wash is optional; all it does is make the scone look shiny. My tasters don’t seem to notice a difference. The image below has egg wash on the left, no egg wash on the right. Ironically, it was this exercise of repurposing leftovers that made Thanksgiving feel real to me again, and not like I was churning out some repetitive performance. Because figuring out inventive ways to repurpose leftovers has always been a quintessential part of the Thanksgiving experience. 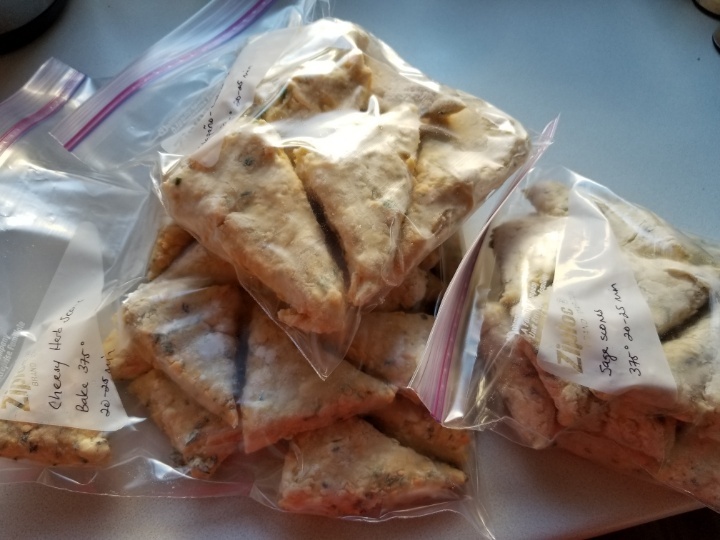 As a bonus, since I had enough herbs to make four batches of scones, now the freezer is stocked with flash-frozen unbaked scones, just waiting to be baked up for breakfast on some cold winter morning. Scones are always best right out of the oven. K cooks a perfect steamed fish. It’s a simple process: start by going to the fish counter at the nearest Asian grocery store. Pick a white fish, of a size that fits comfortably in your steamer. Make sure the eyes are clear. (Cloudy eyes = old fish.) Ask the guy behind the counter to clean it for you. Take it home, scrape off more scales if you need to, snip off the fins if they’re still there. (I love eating fin, but only when deep-fried.) 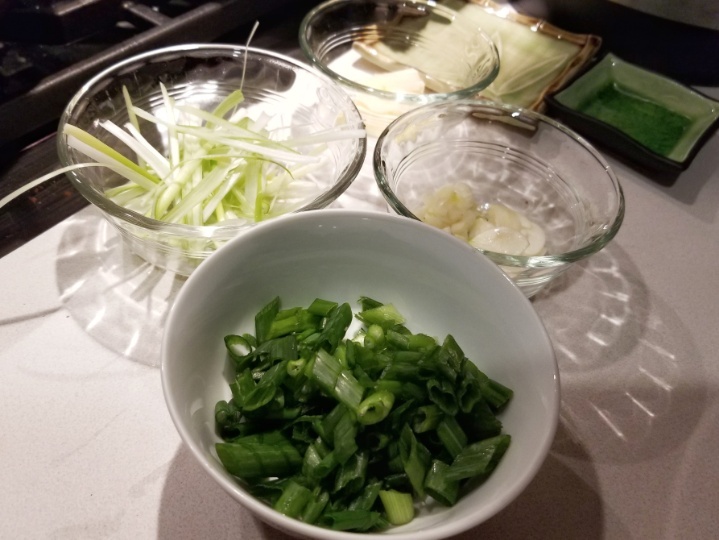 Season lightly, inside and out, with soy sauce, sliced garlic, matchsticks of ginger, cut scallions. Place in steamer, cover, and steam until the flesh is flaky and opaque. Serve whole, in the middle of the table, where everyone can reach it. K’s mother goes one step further by drizzling hot oil over the fish when it comes out of the steamer, crisping the skin. It’s delicious either way. Eat it over rice. 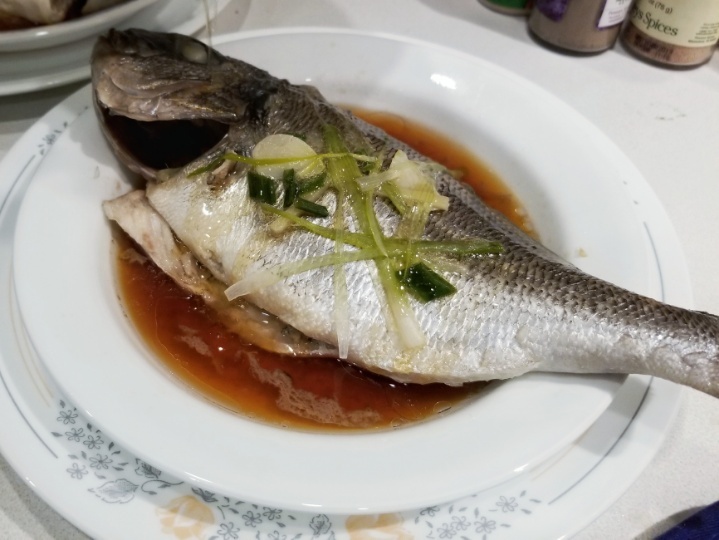 The fish will come out swimming in a thin savory sauce, and you’ll want to drip that sauce over each bite of fish and rice. Our older kid loves fish. He’s gotten to be a pretty good eater; he will eat (or at least try) most foods, though he does complain when he sees a vegetable reappear that he hadn’t liked the first time around. The little one tends to flat-out refuse foods that she doesn’t want, but hopefully she’ll come around. Anyway, we must not have had whole fish in a while – maybe a couple of months, which is a long time for a three-year-old – because she was dramatically shocked to see us disassemble it, splaying it apart to reach the meat, pulling away the spine with the ribs attached, digging into the head for the tender cheek. We’ll have to have whole fish more often, I think; it’s good to be reminded of where meat comes from. One of the things I love most about eating whole fish is that you get to enjoy all of your favorite bits in the same meal: the melt-in-your-mouth cheek, the fatty collar, the soft belly, the generous meaty flesh around the ribs. There are also the bits that are harder to eat, where the meat is interwoven with thin translucent bones that sneak into your mouth and poke your tongue and cheeks like tiny needles. You have to eat small, cautious bites, find the bones with your tongue, and spit them out. It’s a slow and messy process, not graceful at all, and utterly worth it. For me, whenever I pick the fish meat oh-so-carefully out of the smaller bones, I find myself thinking of my mother and grandmother. My mother loves cooking salmon heads, then picking out all the lovely meat from the tiny crevices. “Can you believe it,” she would say, “fish heads for such a low price! People just don’t know how good they are!” (Her salmon heads really are delicious; I’ll have to get the recipe.) And when we ate fish with my grandmother, she would remain at the table, still eating, long after everyone else was done. We kids would have drifted off, having eaten our fill of the easy meat, but my grandmother would sit patiently and delicately nibbling at the smallest bones, extracting and savoring every last morsel. I can see her clearly in my mind’s eye, alone at the table, chopsticks hovering by her mouth as she worked the fish through her teeth, straining meat from bone. I love to cook and eat a whole lot of different things (oh so many different things! ), but for me, simple steamed fish and white rice is the dish that tastes like home. It’s a really great time to be a parent, is all I’m saying. Candy we don’t have this year: Snickers, Milky Ways, Butterfingers, 3 Musketeers. Apparently they don’t exist on this side of the border? Candy we do have: Kit Kats, M&Ms, Skittles, Reese’s Pieces. So there are plenty of familiar items. We also have Smarties, but they’re not the Smarties that I was used to back in the States. 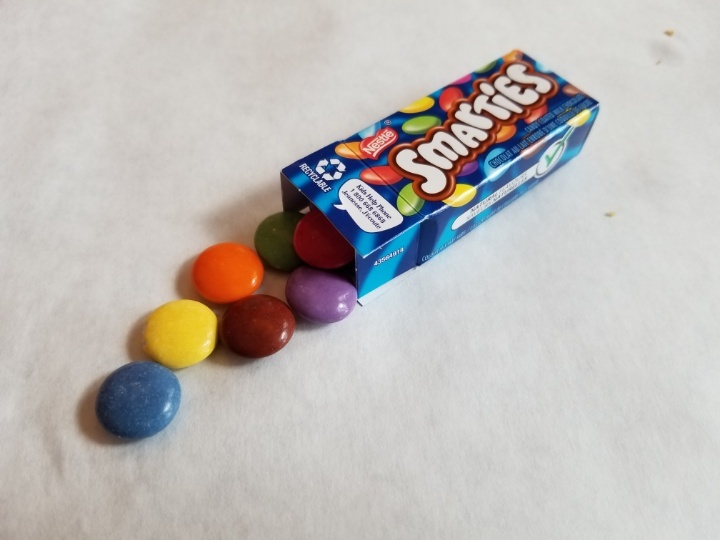 Smarties here are kind of like M&Ms, in that they are made of chocolate and covered with a hard candy shell. But the candy shell is thicker and crunchier. 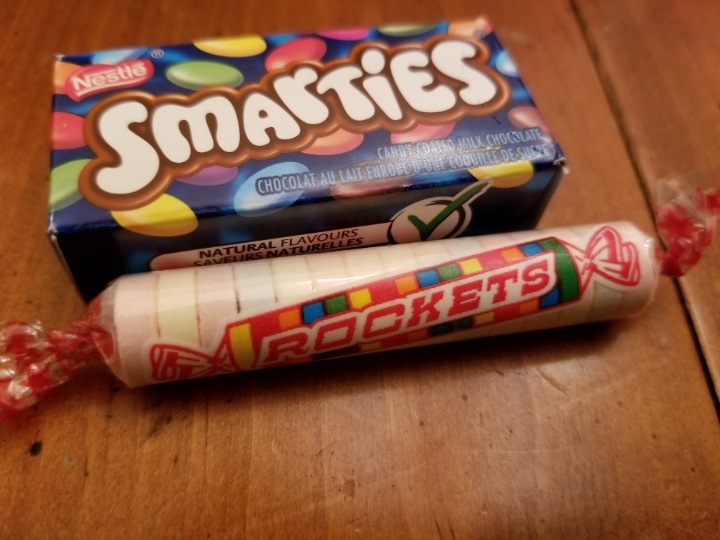 The Smarties that I’m used to, the powdery pastel-colored disc-shaped candies arranged in a tube, go by the name Rockets here. Yeah, it’s confusing to me too. 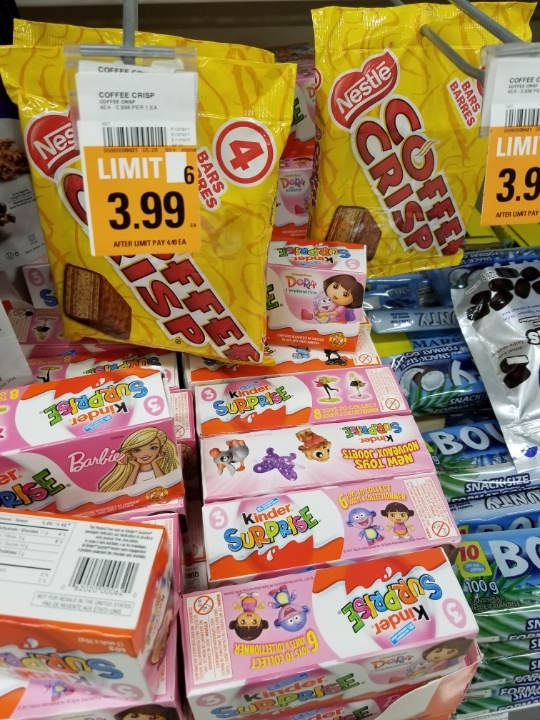 There are also a bunch of chocolate bars here that aren’t carried back home – mostly the Cadbury line (more on that later), but also some Nestle products. There were quite a lot of Aero bars, which is basically chocolate lightened with air bubbles. My favorite Nestle Canada bar, though, is the Coffee Crisp, a wafer filled with coffee flavoring and covered in chocolate. I love it so much that I bought up extra bags of it to take home every time I visited family in Canada. I have long been boggled that there is no mass market coffee flavored chocolate in the States. It’s okay though, I’m in Canada now. I have all the Coffee Crisp I want. The above picture also displays another chocolate treat not allowed back in the States: the Kinder Egg. I’ll probably do a whole separate entry on the Kinder Egg later. The kid did actually score a single Kinder Egg this Halloween, but generally people stuck to handing out fun size bars and candies. We got plenty of Cadbury chocolates too. Here’s the giant Cadbury box I saw in the grocery store. 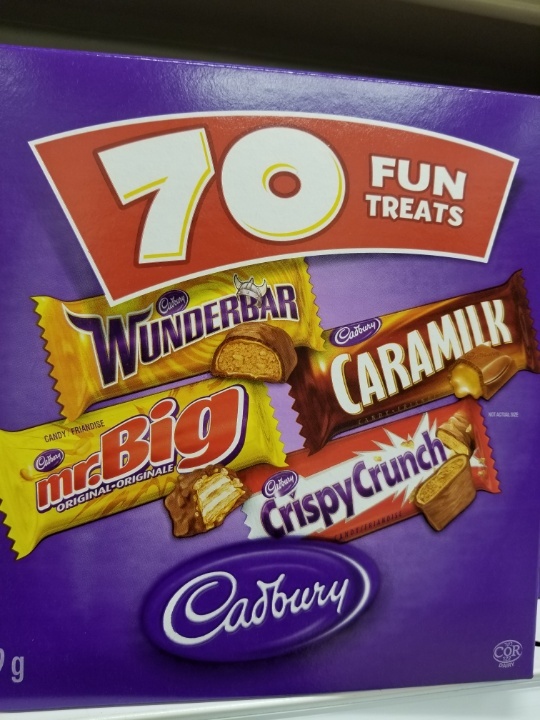 I love the Wunderbar, which has a peanut center and a caramel coating underneath the chocolate. The Mr. Big is also pretty good; it’s got a wafer center and a nice crunch from the crispy rice. (I’m also fond of it because one year we came to Canada and saw Alex Ovechkin on the candy wrapper, with the text “Mr. Big Deal.” Of course we had to buy a couple of bars, to hand out to fellow Caps fans back home.) The kids didn’t get any Caramilk so I can’t speak to it – I assume it involves caramel. And the Crispy Crunch was basically a version of the Butterfinger, but flatter (so the butterscotch-to-chocolate ratio was tilted more in favor of chocolate) and a little sweeter. Good job, kids – great haul. Now I just need to figure out how to get rid of all this candy, because no one needs this much refined sugar. I’ll have to harvest all of the Coffee Crisps first, though. So it’s the little differences that give you a moment’s pause. Why do the kids’ chicken fingers always come with “plum sauce?” Why are ketchup flavored potato chips so popular? Why do Wheat Thins look and taste different from the Wheat Thins back home, even though the box design is identical down to the font? What is the deal with all these tiny cucumbers? How do I deal with milk that comes in bags? To be clear, you don’t have to buy milk in bags. You can get cartons. But the bags are super convenient! You can buy 4 liters at a go, conveniently split into 3 bags (why 1.33 L is the working unit for milk, I have no idea) so you only need open one at a time, which keeps the others fresher for longer. Also you get to reuse your cute little plastic pitcher. Although I was totally prepared to embrace the bagged milk phenomenon, I encountered a few snags in execution. 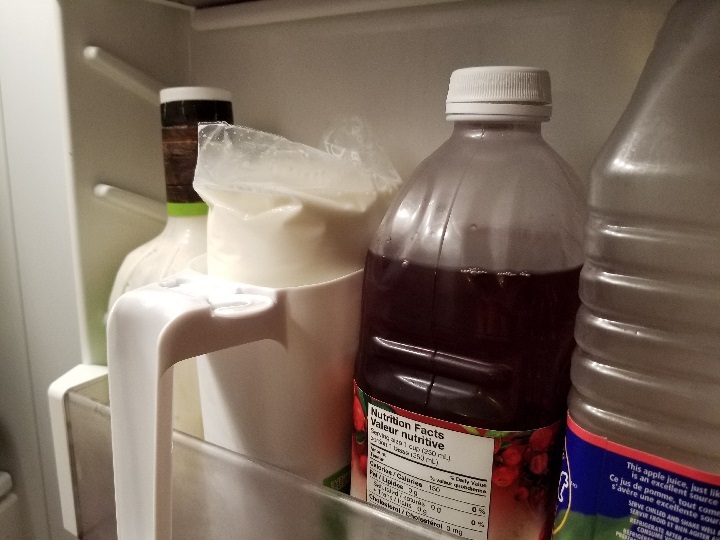 For one thing, a new bag of milk doesn’t fit completely into the pitcher – it protrudes, the liquid level sitting ominously atop the rim, looking like a spill waiting to happen. 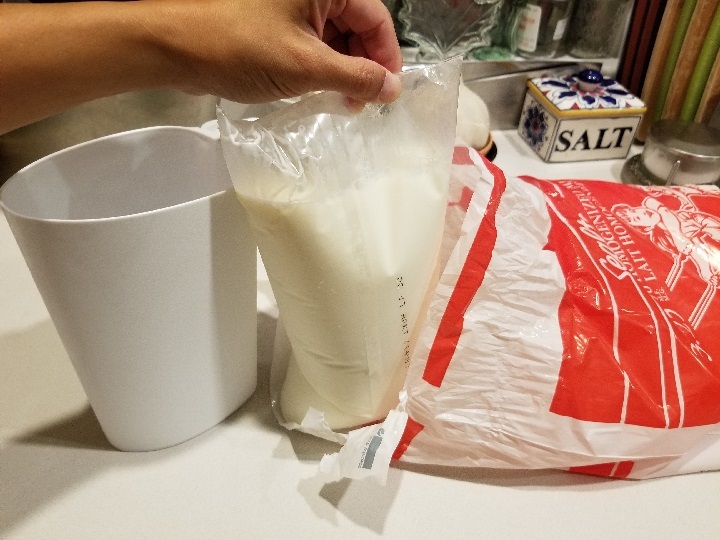 Through talking to other bagged-milk consumers, I have learned that a crucial part of initial bag installation is the thumping – I thump the pitcher, with the milk bag still sealed (don’t do this after opening! ), repeatedly on the countertop until the milk bag settles fully into the pitcher. Otherwise you can get a pocket of air at the bottom. The milk level will still be above the pitcher’s rim when you start, though. It’s disquieting but you will just learn to have to deal with the dread. We bought a pitcher with a bag cutter included, because I thought it would be handy. It was not. It chews up the bag, rather than cutting cleanly, and in the process, you get milk splatter everywhere. Now I use scissors to snip the corner. 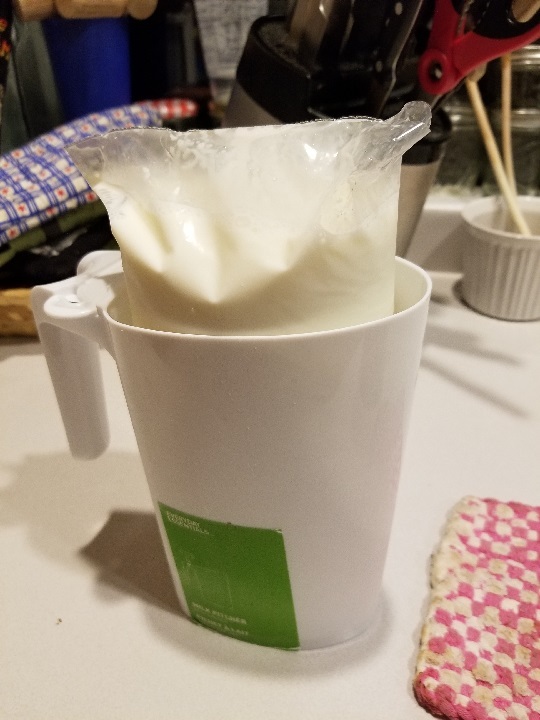 I have talked to other users of bagged milk and everyone has a different recommended angle – some adhere to a rigid 45 degree snip, some do a shallower angle, some deeper. The only way to find out what works for you is through experimentation. I personally find that a shallower angle provides better control. 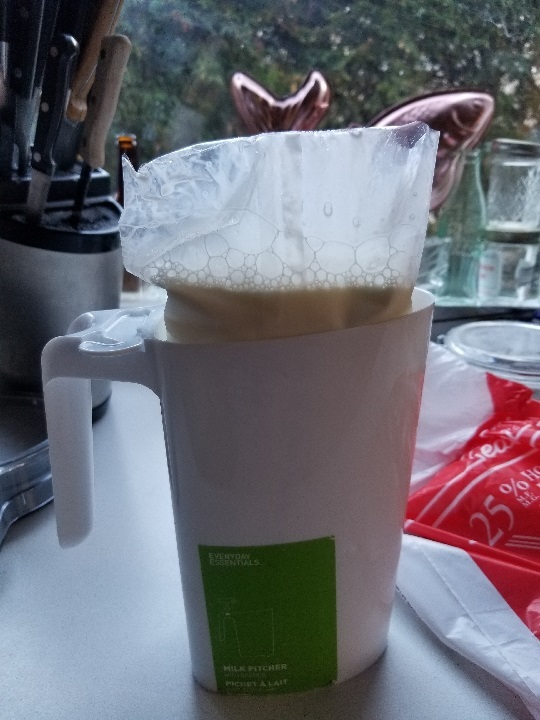 When I pour, I hold the handle of the pitcher with one hand and pull back on the opposite corner of the bag with the other hand, to keep the plastic nice and taut near the spout area. Otherwise you risk unpredictable folding and drooping of the milk bag during the pour, resulting in a stream of milk that is anything but constant and steady, possibly even missing the target entirely. I still love it though. Like any new tool, it required an adjustment period at first. But for me the benefits definitely outweigh the drawbacks. And the single bag, in the thin milk pitcher, fits neatly in the refrigerator door. It should be noted that this bagged milk phenomenon is not universal to Canada. 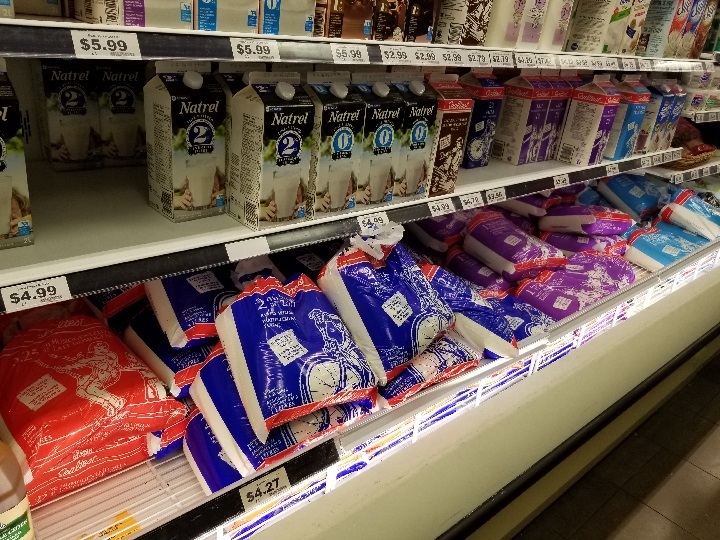 I think I used to see bagged milk when I visited my family in Vancouver as a kid, but it’s been phasing out, and the last few times I was in town everything was cartons and bottles. It might just be an Ontario thing? or even an Ottawa thing? Regardless, I’m definitely embracing it as part of my Canadian experience. We’re moving in just a couple of weeks. I sit here, Wednesday night, amongst a pile of papers and things, in a house full of even more things, and packers are coming on Monday. Any sane person would fall to organizing things: household goods shipment items over here, long-term storage stuff over there, stuff going to Goodwill in the basement, stuff going to the landfill in the garage. 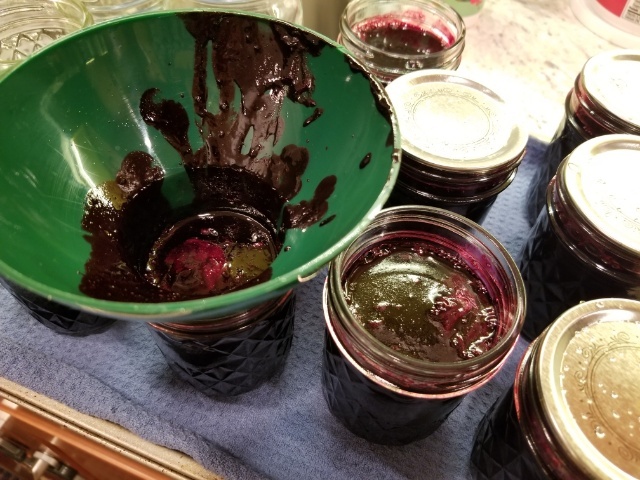 So of course, I spent the evening making black raspberry jam. You see, moving out of a house is actually when you get everything done that you’ve been putting off for years. New roof? Check. Install ceiling fan/light fixtures in every bedroom? Check. Clean out basement detritus? Check. 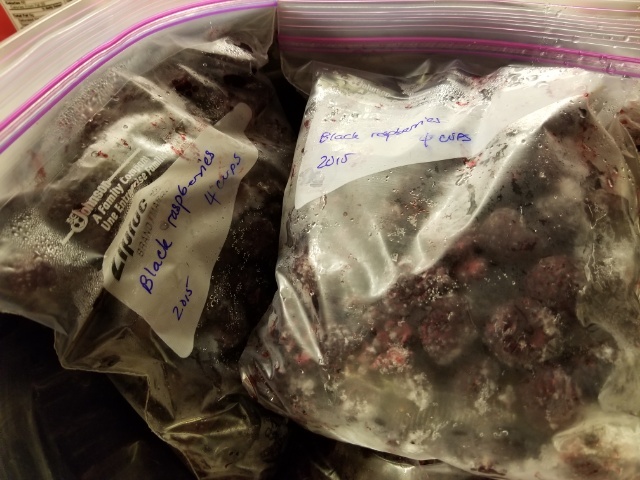 Clean out the freezer, including those five quart-sized bags of black raspberries that you picked from Larriland Farm two summers ago? Last time I made raspberry jam it had seeds in it, and they were crunchy and got stuck in one’s teeth and ruined everything with their mere presence, so I went to great lengths to de-seed the raspberries this time around. I cooked them a bit so that they were soft (did I mention they’d been in the freezer for two years? 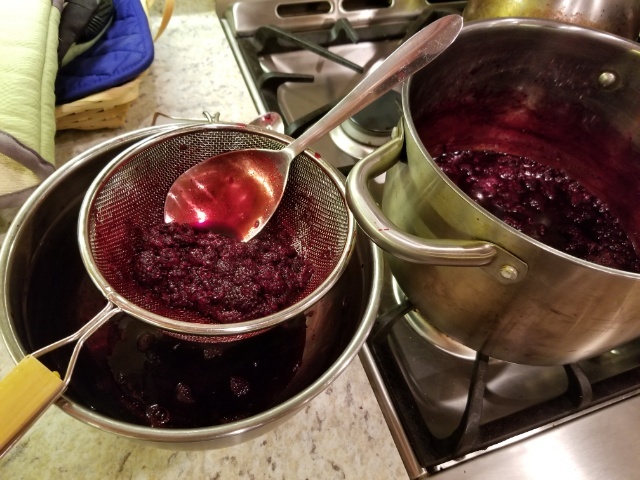 ), then jammed (ha) them through a strainer with the back of a spoon, occasionally scraping the pulp off the bottom side. 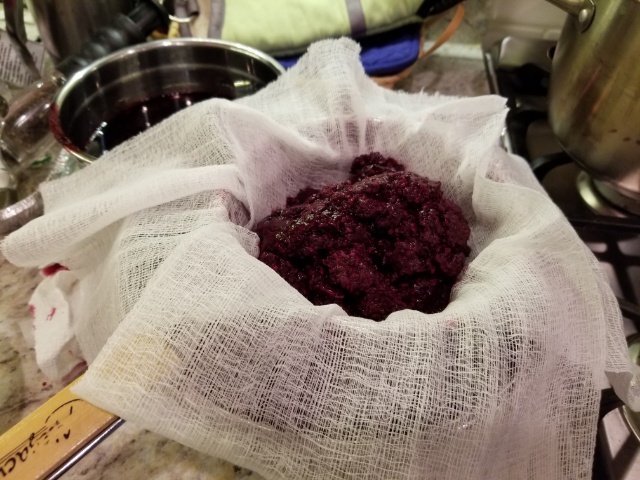 Then, not wanting to waste any of the black raspberry goodness, I wrapped all of the spooned-out pulp in a wad of cheesecloth, wrapped it up, and started squeezing. Man was that a weird feeling. 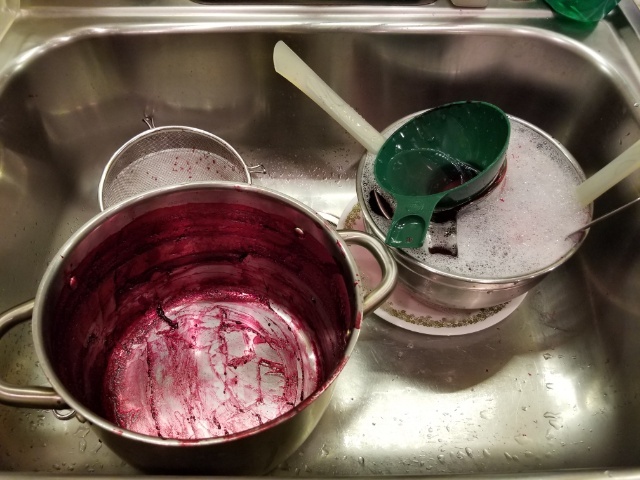 The raspberries were still warm, practically body heat, and the juice that flowed out was dark red and viscous, running stickily over my fingers. I really felt like I was squeezing out someone’s heart, extracting the blood. I bet Hannibal canned his leftovers. I’m sure this is the kind of thought that occurs to anyone making jam late at night. Anyway. 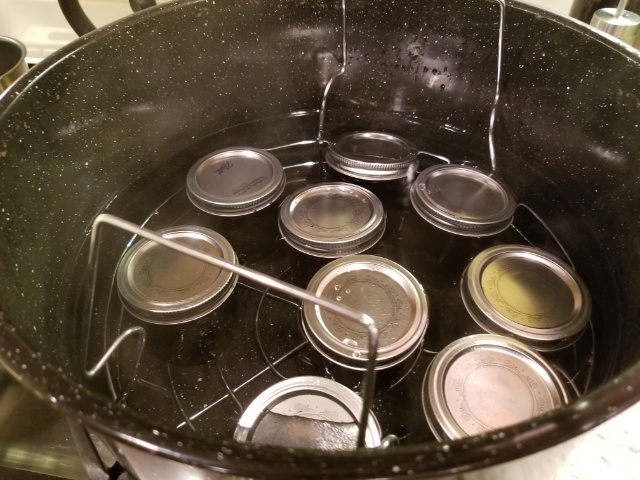 After that, the jam went back in the pot with some sugar, pectin, and lemon juice for the final boil. 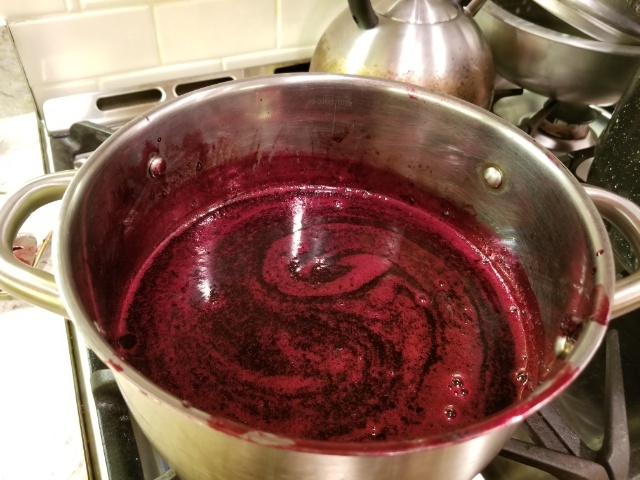 It was awfully pretty, watching the red swirl in the pot. After a lot of boiling, and stirring, and near-misses (this stuff boils up really high and you don’t want spillover, it’s like napalm on your countertops), it was time to funnel it into the sanitized jars (thank goodness for the sanitize cycle on the dishwasher). And, into the water bath they went. More boiling followed. 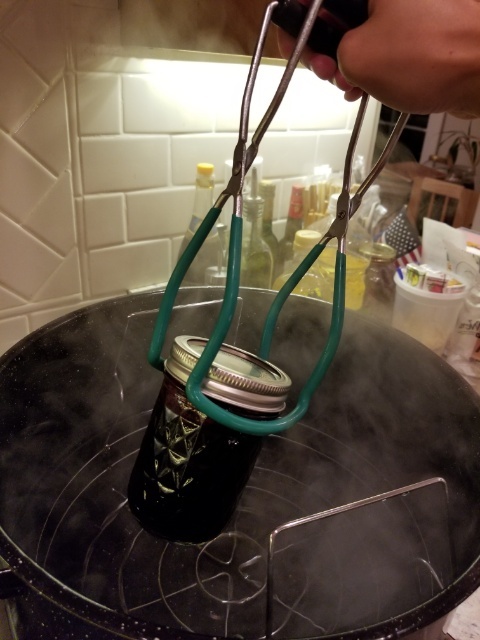 I love these jar tongs. I’m so over the no-unitasker-allowed-in-the-kitchen thing. Look, you can even see that the lid’s sucked down. Successful seal accomplished! At the end of the night I hadn’t gotten any more packing or organizing or decluttering done. 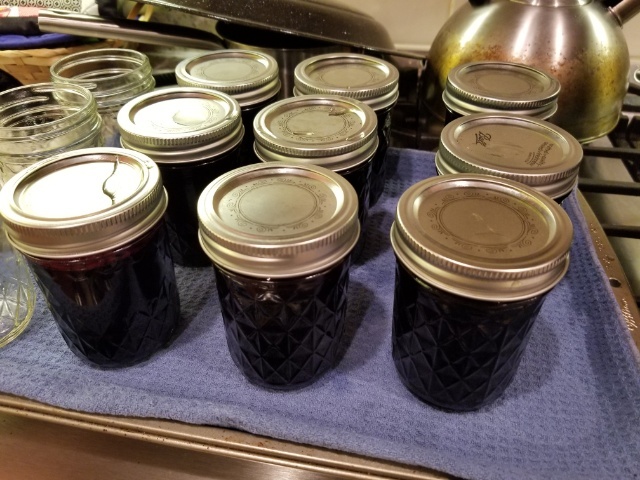 But I had turned stuff the movers wouldn’t take (hand-picked frozen black raspberries) into stuff that they would (sealed, shelf-stable jars of jam), so hey, it’s progress. I’m counting it as a win. Though, there’s always more work to do. Rt 40 giveth and Rt 40 taketh away. 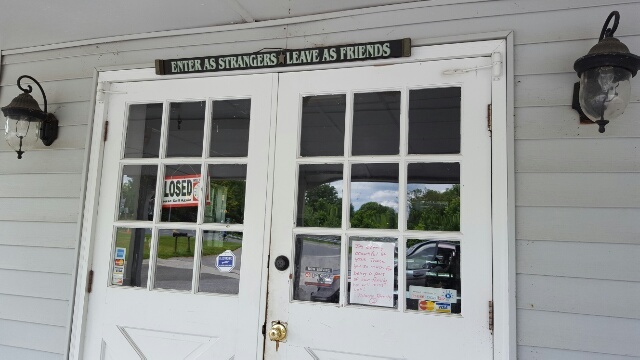 We drove up to Kolache Kreations this weekend and it was quiet and still, with a CLOSED sign on the door and FOR SALE / FOR RENT signs in the windows, and a note on the door saying a gracious goodbye. I’m very sad to see them go; their delicious kolaches were my go-to dinner plan if I got stuck at work late and needed something quick to feed the family. Hopefully something just as lovely and intimate will take their place. But on the bright side: BUBBLE TEA. Oh sure, you think you already know the glory of bubble tea. But as I’ve complained before, there really hasn’t been good bubble tea in Ellicott City… until now. 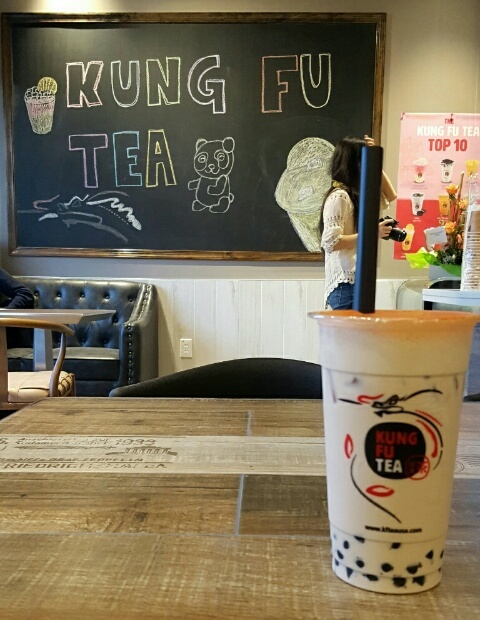 Kung Fu Tea, which just so happens to be one of my favorite bbtea spots in Rockville and in Chicago, has opened up a branch in the same shopping center as Honey Pig. And I’m happy to report that their bubble tea is just as good it is in their other locations – nice, consistent texture to the bubbles, and good flavor on the drinks. They’re still training the staff, but my orders (I love the KF Milk Tea and the winter melon jasmine green tea, both with bubbles of course) came out smoothly and with no apparent fuss. They certainly look like they’re offering the full menu of drinks; the menu is up on two brightly-lit TV screens and it’s definitely a wall of text – lots to process, lots of options. Plus it’s just a great place to hang out. Like their Rockville location, there are chairs and tables where you can sit and socialize, and games you can borrow (I’ve seen people playing Jenga and Connect Four). Unfortunately, it’s a pretty small place, so – like the Rockville location – I can see it getting crowded pretty quickly. I’ll still go, though. Often. Yay for real bubble tea! 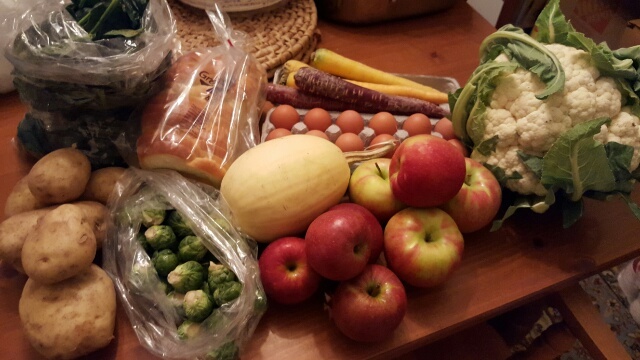 This was the last week of this year’s Breezy Willow CSA. It’s like a picture of what’s awesome about fall. 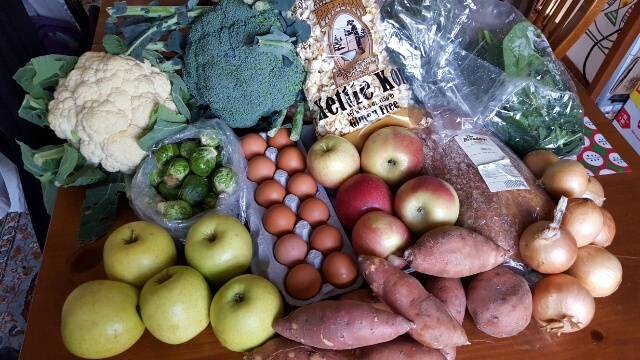 Huge heads of cauliflower and broccoli, brussels sprouts, Golden Delicious and Fuji apples, sweet potatoes, onions, spinach, Cacoctin Kettle Korn, eggs, and bread (Breadery ciabatta). Week 23 was actually two weeks ago, and we’ve now eaten all of the stuff in the pickup except the sweet potatoes, which are currently still waiting patiently on the dining table. They’ll get roasted up sometime this weekend, I’m sure. Today is the final day of a three-day workweek, which meant that I got to pack only three days’ worth of lunches this past Sunday night. I was pretty excited about having the week mostly taken care of on Sunday. 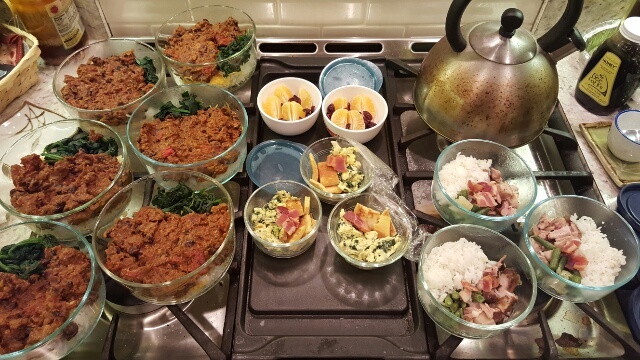 Check it out: three days, twelve lunches. K and I have chili over rice with spinach; the Little Prince gets rice with green beans, chicken, and a smidge of bacon (bribery), the Little Princess gets pancakes, spinach scrambled eggs, and bacon (breakfast foods are good finger foods), and you can also see the Little Prince’s fruit sides (mandarin orange segments with dried cranberries); I only made two but it was easy enough to make the third last night. It takes a lot of prep for everyone in the family to get homemade meals every day, but if you do things in bulk, it pays dividends in time on busy weeknights. I’m really looking forward to our multiple Thanksgiving meals this weekend (two local families = two Thanksgivings and no arduous travel! We’re really lucky). The best thing about Thanksgiving is the potluck nature of it all; if you do things right, you only need to make one or two dishes out of several, and then you get to stuff your face with family and friends. Have a great Thanksgiving, everyone. Every fall is always filled with mixed emotions for me. I love fall — the slight chill in the air, the crunchy leaves, pumpkins and gingerbread and apple cider — but on the other hand, the farms are shutting down. Next week will be the last week of the CSA, and the last week of the HoCo farmers’ markets. I’ll have to actually buy my produce from a grocery store again, from cashiers who may not be able to identify the items on sight. You take a lot for granted when shopping at a farmer’s market. When you pick up an item, you can ask: is this eaten cooked or raw? Do you have any tricks for preserving it? How do you prepare it? And not only is the farmer happy to talk with you (assuming the stall isn’t slammed with customers), but you’ll soon have a dialogue going with the other shoppers, who are also happy to share their experiences, recipes, and recommendations. The community feeling is just incredible, and not something you generally get at your local grocery store. ANYWAY. The penultimate week of the CSA brought us a pound of spinach, 3 pounds of white potatoes, a pound of brussels sprouts, a spaghetti squash, five large rainbow carrots, another enormous head of cauliflower, eight apples (the all-red ones are Staymans, and the yellow-reds are Jonagolds), and the usual eggs and bread (Great Harvest challah). I love brussels sprouts; cut in half and tossed with olive oil and spices, and roasted until the edges caramelize, they turn into crunchy-on-the-outside, tender-on-the-inside little nuggets of awesome, and I consider them the perfect food to nosh on while watching a football game. As a bonus, the Little Prince likes them too. Pick the little ones; they’re the sweetest. 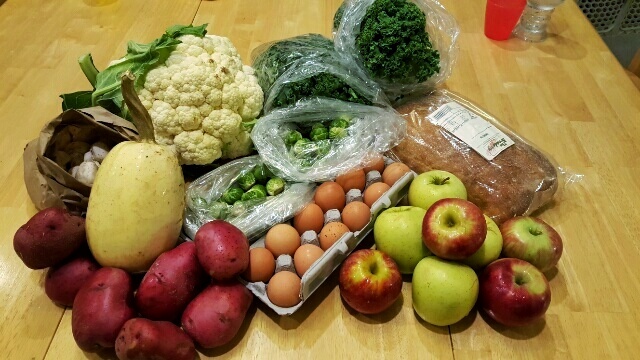 That’s an absolutely enormous cauliflower, a pound of kale, brussels sprouts, a spaghetti squash, white mushrooms, red-skinned potatoes, two kinds of apples (Golden Delicious and Stayman, I think), and the usual eggs and bread (Breadery ciabatta). I’m eating one of the Golden Delicious apples as I type and although it’s a tad mealy, the flavor is so sweet and refreshing, I still love it. 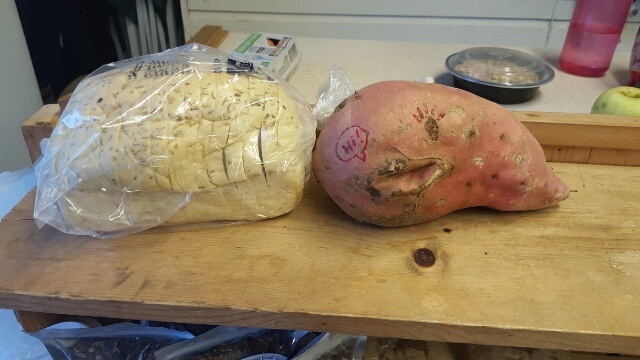 Let’s also check out this gigantic sweet potato that Casey brought in from the field (and apparently decorated). Yes, it’s as big as a loaf of bread. Crazy, huh? The Little Princess turned one this past weekend, which means that K and I have been able to keep two kids alive simultaneously for an entire year. We threw a party to celebrate, with plentiful food. 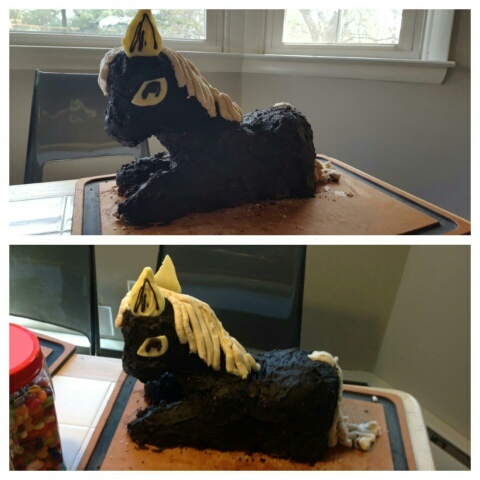 We stuffed three pumpkins (bacon & cheese, chard & cheese, wild rice & mushroom) and I made a cake, horse-shaped for my little Year of the Horse girl. Eyes and ears are made of white chocolate, with dark chocolate scribbled on top to provide details. 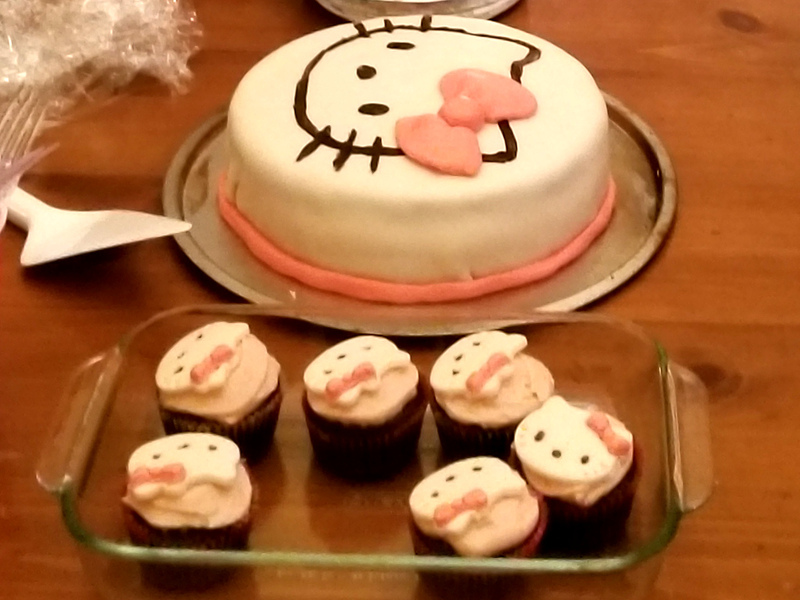 I’m pretty proud of the cake, even though structural instabilities meant that the head fell off halfway through the party. 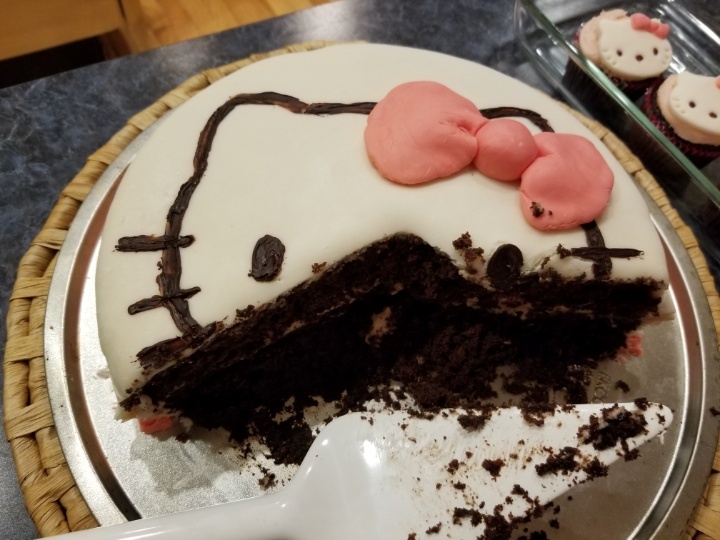 It’s okay; it was all edible, so we just gave the head to the Little Princess to eat. And that dark chocolate buttercream was darn tasty, if I do say so myself. 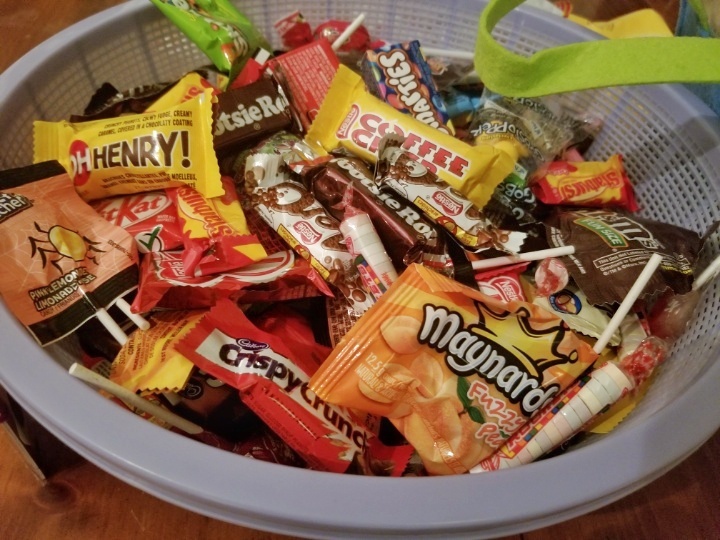 And now, of course, post-Halloween, the house is full of candy, which I’m using to bribe my son to finish his dinner. Whatever works, right? Happy fall, everybody! It’s my favorite time of year. Food processor buttercream is my new favorite thing. Forget separating egg whites; forget running the stand mixer over and over again to beat in sugar in batches. Just dump everything into the food processor and let it whiz until buttercream miraculously appears. For an adult note to the flavor, add a pinch of sea salt. To get the contrasting color, you can make a non-chocolate batch by omitting the cocoa powder and 1/2 stick of butter. This makes enough frosting to cover a horse-shaped cake 7″ long and 2-4 layers tall from back to front, as well as two dozen cupcakes, so it’s a LOT of frosting. Adapted from smitten kitchen. Dump everything in the food processor, cover it up, and start spinning it. I like to pulse it a few times to get everything mixed up before letting the processor really rip. You’ll have a beautiful thick buttercream in no time at all.